The 160-acre Omaha, NE property from which we reclaimed several buildings has been in the Klinker family for over 120 years. This product was made from the barn (pictured), called the “machine shed” by the Klinkers, and built in the 1940s with the douglas fir used to build the original 19th century home. In 1868, seventeen-year-old John H. Klinker, along with his parents and siblings, immigrated to America from Germany, spending some time on the East coast in Philadelphia before buying land in Nebraska in 1877. They lived in a sod house for some time before acquiring the current 160 acres of property where the corn crib and machine shed stood. John H. Klinker, the current owner’s great-grandfather, built and first occupied the “main house,” shown in the old photographs below. 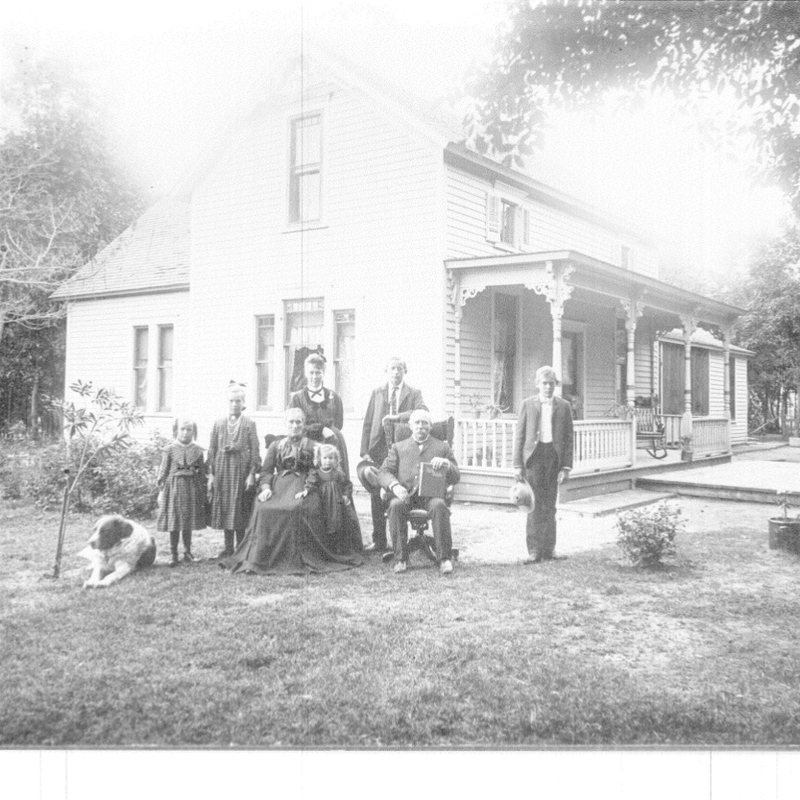 The 1905 picture features the seated couple, John H. Klinker, (holding the Bible) and his wife Catherine, and their five children, Elsie, Anna, William, Helen and Louise. Other people in the photos are hired help. The existing farmhouse, where the current owner grew up, was built in 1917 or so, about the time his grandfather, William, married Anna (Wilke). 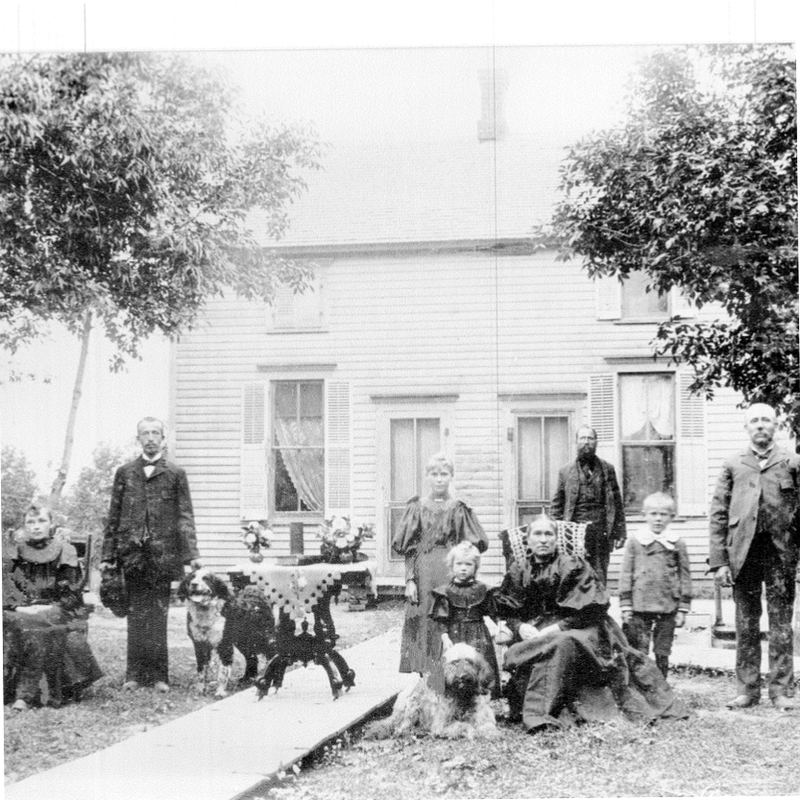 John H. and Catherine Klinker both died in 1929, and at that time William and Anna were in the 1917 farmhouse raising their three children, Dorothy, John (the owner’s father), and Eleanor. After John died in 1977, his wife continued to reside in the 1917 house until her death in 2012. The original older home, meanwhile, served as a playhouse for a time between 1929 and 1940. Eleanor remembered playing in the old house, drawing rooms on the floor with chalk. In 1940, it was torn down and the wood reused to build the machine shed. 1895: John H. Klinker is standing on the right with Catherine seated. The little boy is the current owner’s grandfather William, the little girl is Anna and the tall girl is Elsie. The other people are hired help. 1905: This picture includes the two youngest daughters, Helen (between the dog and Anna) and Louise (with her hand on Catherine's lap). The boy on the right is William, and the man behind John's chair is hired help or some other relative. 1915: Back row from left: Louise, Anna, William, Elsie and Helen.